Benchmarks are obviously just that 'benchmarks', and do not necessarily test real-world application usage. 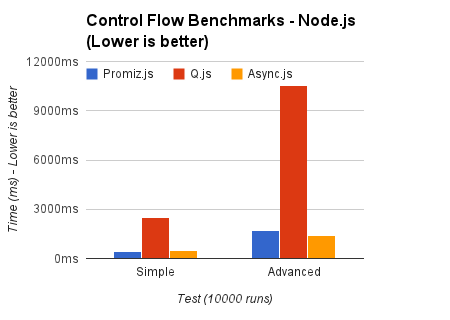 However, I feel that they are still quite important for a control flow library, which is why Promiz.js has been optimized for performance. There is however, one thing I should mention: Promiz.js will attempt to execute synchronously if possible. This technically breaks spec, however it allows us to get Async.js levels of performance (note: Async.js is not a promise library and doesn't look as clean). // Values get passed down the chain. Now, lets define our promise object. Remember, to be spec compatible, it must have a .then() method, and have a state. In order to be able to chain these calls, we're also going to need to keep track of what we need to call later. This will constitute our stack (functions that need to be resolved eventually). Alright, so this resolve actually does two things. It checks to see if we've already been resolved (by checking our pending state) which is important to be spec compliant, and it fires off our resolved value to start consuming the stack. At this point, were almost done (!). We just need a function that actually consumes our current promise stack (the this.fire() - the most complicated function).